The recent negotiations in Vienna have shown that the principles driving the positions of the “The Six”–the United States, Britain, France, Germany, China, and Russia–differ markedly from those of Iran. Based on several discussions with senior members of the Six, the principles underpinning a deal must include: 1) sufficient response time in case of violations; 2) a nuclear program meeting Iran’s practical needs; 3) adequate irreversibility of constraints; 4) stable provisions; and 5) adequate verification. The Six want to ensure that Iran’s nuclear program is peaceful and remains so against a backdrop of Iran’s nearly twenty years of non-compliance with its obligations under the Nuclear Non-Proliferation Treaty. These principles also reflect long experience in negotiating arms control and non-proliferation agreements and a recognition of the strengths and weaknesses in those agreements to date. Iran on the other hand has emphasized the principles of cooperation and transparency. These principles are predicated on its assertion that its word should be trusted, namely its pronouncement that it will not build nuclear weapons. These principles also reflect its long standing view that any agreement should have constrained verification conditions and minimal impact on its nuclear programs, even allowing for their significant growth, despite the current lack of economic or practical justifications for such growth. The Six have rejected many of Iran’s negotiating positions because they can be undone on short order, offering little practical utility in constraining Iran’s future abilities to build nuclear weapons. The Six note that Iran on numerous occasions in the past has shown a willingness to stop cooperation with the International Atomic Energy Agency (IAEA) and reverse agreed upon constraints. The Six simply cannot agree to lift a robust and painstakingly built international sanctions regime on Iran in return for inadequate and reversible constraints. According to a senior U.S. official speaking about the recent negotiations in Vienna, Iran now has a chance to re-evaluate its positions and “come to terms with reality.” By many accounts, Iran made few tangible concessions in the negotiations so far, but Iran left the recent negotiations in Vienna understanding that the Six will remain steadfast on key positions limiting Iran’s nuclear programs. But Iran can be expected to try to increase pressure on the Six to weaken their principles. They must resist this pressure and remain loyal to their principles in order to obtain a good agreement. One of the Six’s key principles is that an agreement must provide sufficient time to mount an effective response to major violations by Iran. There are two parts to this principle—one involves intrusive IAEA inspections able to promptly detect non-compliance (and address it by effective verification) and the other recognizes that even the most intrusive inspections are alone inadequate to provide enough response time in the case of Iran. The latter, adequate response time, requires significant limitations on Iran’s nuclear programs and translates into a need to limit Iran’s pathways to making nuclear weapons. Of course, there is little risk that Iran would break out today at its known enrichment sites. Currently, breakout would take at least two months.4 Breakout today by Iran at its enrichment plant would be detected conclusively within a month, and U.S. policy is known to be to prevent Iran from getting a nuclear weapon, implying that a prompt military strike could be expected. In this sense, Iran is perceived as being deterred from breaking out. But it should be remembered that one accomplishment of the interim deal, the Joint Plan of Action (JPA), has been to freeze Iran’s centrifuge program and by doing so it has prevented Iran from achieving dangerously short breakout times of as little as a week or two, which Iran was on track to achieve in 2014 (see figure 1). With very short breakout times, Iran may view breakout very differently in a crisis than it does today. The future situation may not be as clear as today, and any agreement must provide assurance in the long term. A central goal is to prevent Iran from being able to rapidly put in place a dangerously short, overt breakout capability as it was doing before the JPA was signed in the fall of 2013. In that sense, centrifuge numbers matter greatly. But there are other reasons to shorten breakout times. In the past, Iran has conducted questionable activities or concealed them in unexpected ways that were not quickly detected. Achieving the requisite evidence to judge with high confidence that violations had occurred was time consuming and intelligence reliant in key cases, such as the discovery of the once-covert Natanz and Fordow Fuel Enrichment Plants, illicit centrifuge R&D at Kalaye Electric, black market nuclear related imports, some with possible military uses, and the still unresolved file on the development of nuclear weapons. Assuring for the duration of an agreement that Iran is deterred from misusing its centrifuge plant as part of a scheme to obtain nuclear weapons may be difficult to accomplish, despite it today being a non-ideal route for a breakout. Perhaps Iran’s security situation becomes such that it decides it must pull out of a deal. Or it may believe the West has not fulfilled its commitments to loosen sanctions. It could seek to sow confusion by delaying IAEA inspections, moving to resume production of near 20 percent enriched uranium, or installing additional centrifuges there. Iran may calculate in the future that there will be no military response to its production of highly enriched uranium and simply start doing it either under safeguards or without them. In both of these cases, short breakout times equating to short response times for the United States and the international community would create markedly more instability than longer ones. The time frame preferred by the Six of 12 months for a breakout is derived from considerations of the time needed to reliably detect the breakout and put together an effective international response. The shorter the breakout time, the less opportunity there is to stop it. Moreover, longer breakout times may allow for a non-military response; shorter breakout times may force a quick military response if Iran appears to be cheating. Maintaining a policy to conduct such a military response is undesirable and is likely to become increasingly difficult over time. In short, breakout times must be sufficiently long enough to allow for an international response able to reliably stop Iran from producing its first nuclear weapon, and breakout calculations are a useful method to identify the appropriate residual centrifuge capability. Limiting overt breakout complements efforts to ensure that Iran does not build a covert centrifuge plant to produce weapon-grade uranium, or at the very least, that such activity is reliably detected. An Iranian centrifuge program downsized to 2,000-4,000 centrifuges would help assure that the program and its research and development (R&D) and manufacturing complex can be verified against banned use. Tehran would then have a much more difficult time secretly building enough centrifuges for a covert plant. Simply put, a smaller centrifuge program in Iran would help ensure a verifiable centrifuge R&D effort and centrifuge manufacturing complex. On the other hand, a larger residual centrifuge program may exceed the abilities of the IAEA to ensure that centrifuges or related items are not being diverted. As is the case today, a larger program also makes it easier for Iran to hide illicit foreign procurements, some of which could be slated for a clandestine program. It should be noted that while breakout time does not include the total time to produce a nuclear weapon for testing underground or mounting on a missile, the production of the weapon-grade uranium is the more difficult and time consuming portion of making a nuclear weapon, often referred to as the “long pole in the tent.” Once Iran has enough weapon-grade uranium for a weapon, the material would ostensibly vanish to covert sites for further weaponization efforts. The ability of the international community to stop it from building a weapon once the material has vanished, short of launching a full-scale war, would become severely limited—and full-scale war is certainly not an option to count on in constructing a long term agreement. In case Iran did not test or overtly deploy nuclear weapons, the situation would be inherently unstable and dangerous, as the region and the world worried that Iran possessed nuclear weapons or was just literally a screw-driver’s turn from having them. From start to finish, the timeframe for Iran to test a nuclear explosive device could be as short as a few to several months after accumulating enough weapon-grade uranium. An underground nuclear test, even in the absence of deployed nuclear weapons, would be extremely destabilizing. Likely, the consequences for regional and international stability would be worse than in the case of North Korea’s underground test in 2006 or India’s underground test in 1974. The impact of these tests was destabilizing, although neither country at the time was perceived as yet having deployed nuclear weapons. Thus, the priority must be to limit Iran’s ability to first produce the weapon-grade uranium. Limiting Iran’s centrifuge program to less than 4,000 IR-1 centrifuges is consistent with Iran’s actual needs for enriched uranium for many years. This number of centrifuges would provide Iran with sufficient enriched uranium for its existing research reactor programs and account for modest growth in them.5 Thus, Iran would not suffer any serious consequences in its nuclear program by limiting the numbers of centrifuges to these levels. These limits would not allow for the fueling of the Bushehr nuclear power reactor, an Iranian demand that helped sink its negotiations with Britain, France, and Germany in 2005 and could likewise do the same today in the negotiations under the Joint Plan of Action. Recently, Iran’s Supreme Leader in essence expressed this demand when he stated Iran requires enough centrifuges to produce about 190,000 kilograms of uranium hexafluoride separative work units per year (kg UF6 swu/year). In more standard units, this number would correspond to almost 130,000 kg U swu/year. This is equivalent to over 130,000 IR-1 centrifuges, where for convenience each IR-1 centrifuge when operating in cascades is assigned an average of 1 kg U swu per year.6 In reality, the actual average value of each IR-1 centrifuge is lower, implying even more IR-1 centrifuges would be needed. Without extensive outside assistance in the form of key goods and advanced technology, Iran has little prospect of actually building so many IR-1 centrifuges or an equivalent number of advanced centrifuges to fuel the Bushehr reactor over the next decade or two. It will need to continue relying on importing fuel from Russia or another major supplier, and its negotiators have admitted as much to the negotiators of the Six, according to interviews by one of the authors of this report. But less self-reliance is actually in Iran’s favor as a way to economize and develop a nuclear power program. In the event of a long term deal, it could develop guaranteed supplies of enriched uranium fuel for commercial power reactors. While Iran may suffer what some have called a loss of face in reversing its position on the indigenous supply of enriched uranium, this effect is usually overstated in its impact and ignores the tremendous risk of pursuing a nuclear program that cannot deliver on what it promises. An often overlooked factor is that Iran has not demonstrated an ability to produce fuel of sufficient quality for the Bushehr nuclear power reactor, a key safety issue. With the accident at Fukushima in the background, Russia has not welcomed the idea of Iranian produced fuel in the Bushehr reactor, which it so laboriously supplied. According to U.S. officials interviewed by the authors, Russia has expressed opposition to having potentially defective Iranian fuel inserted into the Bushehr reactor, fearing an accident which it, as the reactor supplier, could be held liable for. It may also face serious reputational damage in case of an accident that would inhibit others from buying Russian reactors. Its reactor supply contract with Iran may include language making the use of Iranian produced fuel in Bushehr difficult. Thus, besides breakout considerations, an equally strong argument for a smaller number of centrifuges is that Iran does not need to refuel the Bushehr reactor and it is unlikely that doing so will be feasible, absent significant outside help which it is doubtful it would receive. A program with no more than 4,000 IR-1 centrifuges would therefore more than satisfy Iran’s practical needs for the life of an agreement. Another critical principle for the Six is irreversibility. Here the concept of irreversibility is understood as accepting that perfect irreversibility is not possible but in practice recognizes that the restoration of the previous, unconstrained situation should take a long time—on order of years and not months. In the case of Iran, a long term agreement would have little lasting value if Iran can reverse the constraints in a matter of days or months. The case of North Korea contains many examples where nuclear constraints were quickly undone and Pyongyang resumed its march to nuclear weapons. This case also contains important examples of North Korea being unable to establish previous levels of plutonium production when an agreement ended. North Korea shut down and did not maintain its large, nearly finished gas-graphite reactor construction projects, ending its ability to make large amounts of weapon-grade plutonium, as a result of the 1994 US/DPRK Agreed Framework. When this agreement ended suddenly in 2002, North Korea was able to reestablish a relatively small plutonium production capability, which is all it has as of today. Irreversibility is at the heart of the dispute about Iran limiting plutonium production in the Arak nuclear reactor. Although this issue has witnessed great progress, and Iran has shown far more flexibility on this issue than others, Iran still appears unwilling to change the reactor in a manner that is not easily reversed. The Arak reactor has been designed so that it can relatively easily make weapon-grade plutonium at a production rate sufficient to make enough weapon-grade plutonium for about two nuclear weapons per year. Iran has suggested reducing plutonium production in this reactor by using enriched uranium rather than natural uranium; other analysts have suggested in addition lowering the power of the reactor. Combined, these proposals would reduce plutonium production to a fraction of the current value. However, both of these steps are reversible and Iran could in a straightforward, quick manner turn back the clock to a reactor able to make significant amounts of weapon-grade plutonium. There is a simple fix supported by the Six, namely that Iran remove the core and replace it with a smaller one not able to hold enough natural uranium for the reactor to work. Iran so far resists this proposal. With the above changes to the Arak reactor, there would also be no need for heavy water production—regular, “light” water could be used instead in this reactor. The heavy water could be shipped out and sold on the international market. This step would further make the Arak reactor changes irreversible. Iran has also resisted making concessions about what to do with the centrifuges that would exceed a cap on the total agreed upon number of installed centrifuges. If the cap is 4,000 IR-1 centrifuges, Iran would need to remove and render harmless almost 15,000 centrifuges installed in its Natanz and Fordow enrichment plants. If left installed, Iran could within months reconstitute large numbers and create a sizeable breakout capability. Thus, any proposal to keep excess centrifuges at the centrifuge plants is highly reversible and allows a quick reconstitution of dangerously unstable breakout times. Although not articulated explicitly by the Six’s officials, stability as a guiding principle requires provisions that do not lead to persistent accusations of violations or require huge numbers of actions to achieve compliance. Such provisions can undermine the credibility of an agreement and call into question its enforceability. An example involves lowering the amount of enriched uranium Iran has access to while increasing the number of allowed centrifuges to 10,000 or more IR-1 centrifuges, in an effort to increase breakout times. These two steps taken together are not a zero-sum provision; they would create an unstable, highly reversible situation. The instability arises from Iran continuing to make enriched uranium and maintaining residual stocks of enriched uranium to fuel research reactors. In practice, keeping enriched uranium stocks exceedingly low would be impossible. Practicalities of operating a centrifuge plant and a uranium conversion and fuel production complex would lead to larger enriched uranium stocks, undoing the original goal of longer breakout times. Even if the enriched uranium were to be shipped overseas, Iran may hold back sending it abroad, building up a large stock that would significantly shorten breakout times. Such a proposal would require Iran to take actions almost monthly to keep its stocks below the enriched uranium cap, something unlikely to be accomplished easily. One day Iran could simply choose to stop doing so. It could move to hide any violation of the cap by claiming logistical or operational difficulties, many of which would be expected to occur in a program that has encountered many difficulties in its fruition like Iran’s. Any violation of the cap could be sudden and difficult to respond to. Regulating numbers of centrifuges is a far sounder approach than controlling enriched uranium stocks. Effective verification is another core principle, and Iran has refused to make concessions in this area as well. The IAEA must provide prompt warning of violations, determine the correctness and completeness of Iran’s declarations, establish the total number of centrifuges produced by Iran and the size of its uranium stocks, and establish confidence in the absence of undeclared nuclear activities or facilities, including providing assurances on the absence of nuclear weapons related activities in Iran. Iran argues that ratifying the Additional Protocol is enough but while such a step is welcome, it is not sufficient. The long term agreement must also establish a range of other verification provisions, which collectively are often known as Additional Protocol Plus. According to one senior official, Iran has resisted the conditions necessary to create the “Plus”. Accomplishing adequate verification, including the IAEA establishing that Iran’s program is exclusively peaceful, will take many years. A duration of an agreement for twenty years is reasonable in light of the two decades of Iran’s non-compliance with its safeguards obligations and non-cooperation with the IAEA. Iran’s most serious verification shortcoming remains its unwillingness to address the IAEA’s concerns about the past and possibly on-going military dimensions of its nuclear programs. The removal of significant sanctions is not possible unless Iran satisfies the IAEA in this key area. Without addressing these concerns, the IAEA and the Six cannot construct an adequate verification regime capable of detecting clandestine nuclear facilities and activities. The IAEA does not understand how much Iran knows about making nuclear weapons. When did Iran seek nuclear weapons, how far did it get, what types did it pursue, and how and where did it do this work? How long would it take Iran to weaponize fissile material? Was this weapons capability just put on the shelf, waiting to be quickly restarted? Who worked on these projects? The IAEA needs a good baseline of Iran’s military nuclear activities in order to design a verification regime. Moreover, to develop confidence in the absence of weaponization activities, the IAEA will need to periodically inspect past weaponization sites and interview key individuals for years to come. Without more information, it does not know where to go and who to speak to, let alone whether such activity is continuing in a covert manner. Fundamental questions at the core of this decade long controversy would remain unanswered. Moreover, if Iran can prevent the IAEA from inspecting military sites where work is alleged to have taken place on developing nuclear weapons, it could also use that precedent to deny the IAEA access to other military sites, some of which Iran could use later to hide a covert centrifuge or nuclear weaponization plant. Limiting nuclear capabilities at known sites does not make sense if at the same time the deal makes it easier for Iran to make weapon-grade uranium at secret sites. The deal must focus on both potential pathways. Calls to ignore past military nuclear related efforts by Iran are therefore at best naïve and reflecting of a poor understanding of adequate verification and arms control policy, and at worst, highly destabilizing. For there to be a deal, Iran must provide a concrete demonstration that it has given up its nuclear weapons program, such as acknowledging having had a nuclear weapons program, or some sort of “coming clean,” and pledging full cooperation with the IAEA in its ongoing investigation. Without addressing the IAEA’s concerns Iran should not receive major sanctions relief. Adequate verification also requires Iran to verifiably stop its efforts to procure key proliferation-sensitive goods illegally for its nuclear programs. If not stopped, Iran could secretly purchase the wherewithal for secret nuclear sites or activities. This requires a continuation of national and United Nation Security Council sanctions on proliferation sensitive goods for the long term. However, an agreement will need to eventually allow for monitored Iranian purchases for its legitimate nuclear programs and civilian industries while ensuring that Iran is not buying goods illegally for banned activities. Without following these principles, the negotiations cannot deliver an agreement which can ensure that Iran’s nuclear program is indeed peaceful and that a deal will be long lasting. The Six must stick to their principles to guarantee a good agreement. However, if Iran demands that the Six violate their core principles and they give in, the resulting agreement could be a recipe for disaster. Institute for Science and International Security’s estimated breakout times to produce enough weapon-grade uranium for a nuclear weapon. Breakout times have gotten shorter since 2009, reaching a low near one month by the fall of 2013. Under the interim deal of the Joint Plan of Action (JPA), they have increased. 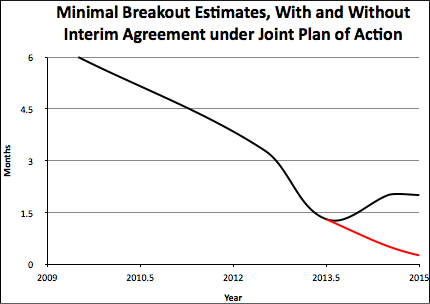 If there had been no Joint Plan of Action, breakout estimates (in red) would have shortened dangerously. 1 Olli Heinonen is a Senior Fellow with the Belfer Center for Science and International Affairs at Harvard University. 2 Defining Iranian Nuclear Programs in a Comprehensive Solution under the Joint Plan of Action, ISIS Report, January 15, 2014. http://isis-online.org/uploads/isis-reports/documents/Elements_of_a_Comprehensive_Solution_20Jan2014_1.pdf 3 An Iranian entity associated with the government published its own breakout estimate, claiming that Iran would need 18 months to break out to enough weapon-grade uranium for a nuclear weapon. However, the Iranian study contained several mistakes. When corrected, the Iranian estimate becomes 2-3 months, similar to the at least two month estimate of the Institute for Science and International Security and the two month estimate stated by Secretary of State John Kerry. For more details, see David Albright and Andrea Stricker, Iranian Breakout Study Drastically Overestimates Time to Nuclear Weapon, ISIS Report, June 17, 2014 (Revised June 20, 2014). http://www.isis-online.org/uploads/isis-reports/documents/critique_of_Iran_breakout_estimates_17June2014-final.pdf 4 This estimate assumes no near 20 percent LEU hexafluoride and existing centrifuges. See: Patrick Migliorini, David Albright, Houston Wood, and Christina Walrond, Iranian Breakout Estimates, updated September 2013, ISIS Report, October 24, 2013. http://isis-online.org/uploads/isis-reports/documents/Breakout_Study_24October2013.pdf 5 Robert Einhorn, Preventing a Nuclear-Armed Iran: Requirements for a Comprehensive Nuclear Agreement (Washington, D.C.: Brookings Institution, March 31, 2014). 6 The value for a single centrifuge is significantly greater but Iran has encountered problems operating centrifuges in cascades and the lesser value of one kg U swu per year factors in these problems.